I posted awhile back about Micawber's friend and neighbor Regula Russelle who has been named the 2011 Book Artist Award Winner. Regula is but one of the many skilled artisans we're lucky to have in these parts keeping an old art form alive and well. The image I've attached to this post serves a double purpose. First, it's an image of Emerson Wulling's workstation. Wulling was an amateur print and bookmaker. He was also the father of a very good customer of Micawber's. When Regula began her work she bought some of Emerson's letterpress pieces. Second, the woodcut that image comes from was done by Gaylord Schanilec. And Gaylord is really a story unto himself. When I first started working at The Hungry Mind in 1999 I was ga-ga over some of the broadsides that were made for our event series. Gaylord was behind all of that. 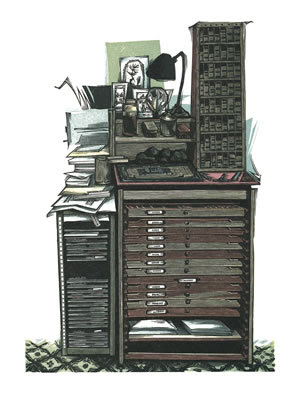 And he continues to make incredible prints, broadsides and books. I count myself lucky to be among his club of regular buyers. Take a look at his website and his work. He continues to buck the trend and works against the quick, easy and cookie-cutter mode that runs almost everything these days. Again, Gaylord's work reminds me that books are not one thing. They are bigger than an electronic screen or simple paper pages. The book is art--and he proves that in every single thing he creates. Well, Hans, thanks for the tip. From an unabashedly, incurably, complete and utter bibliophile.